← Putting the "poke" in "Pokemon"
This week I had some pretty good luck, finally tracking down some much desired Disney stuff as well as the brand new Toys R Us exclusive Iron Man 3 Minimates, the last Western Playmobil set I need and the highly anticipated Dutch figures from NECA. But what could I possibly think of these!? Spoiler alert - some disappoint, some impress and several inspire undying devotion. And what's this... could one of this week's items already be Rustin's pick for Toy of the Year!? 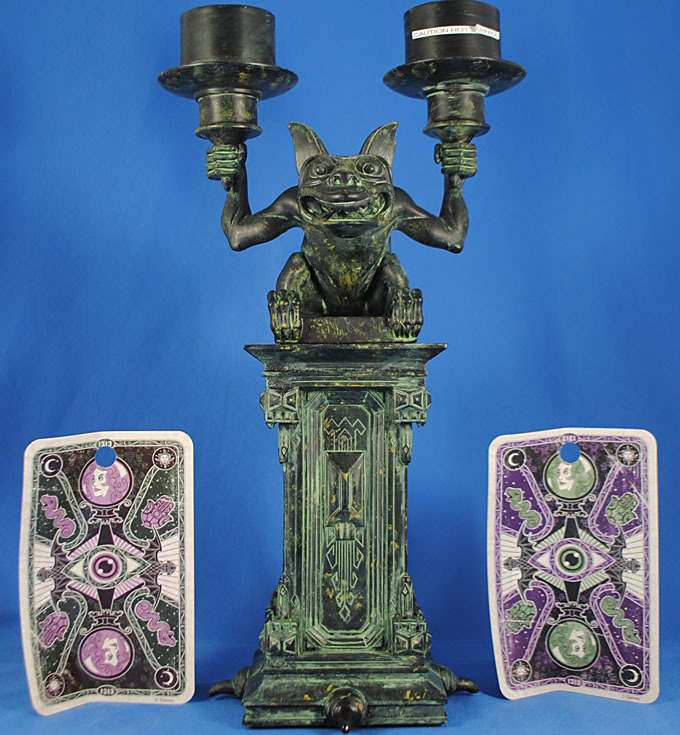 As you may recall I am a MASSIVE Haunted Mansion fan so I was pretty excited when Disney recently unveiled a new batch of actually-cool Mansion merchandise. The centerpiece of it is this Candelabra which I was very lucky to score on a recent trip since shipments have been slow and unpredictable. This is a beautiful sculpt using the Mansion's hallway wooden molding as the base and the signature Stretching Room gargoyles as the candle holders. It stands about 10½" tall and cast in a dark gray resin with a mustard yellow splatter and a light green wash giving it a nice faux bronze look. It gets two cool cards, as tags, with the same pattern but different colors on one side and text on the other that vaguely describes this home decor line - it's a weird but cool-looking and thus welcome inclusion. I fully intend to pick myself up at least one more of these, despite its $40 price tag. 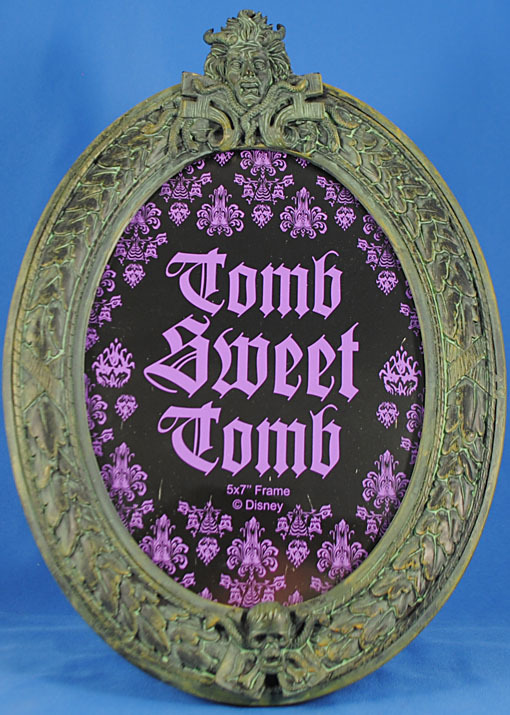 The rock star of this new wave of Mansion merch is this awesome picture frame using the iconic plaque rim for the frame. 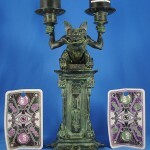 It is beautifully rendered here and gets much the same paint treatment as the candelabra. 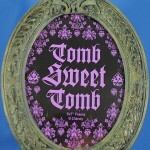 It has a nice insert using the wallpaper graphics around the famous needlepoint "tomb sweet tomb" phrase from the ride - it looks nice enough to leave in there. In fact, I'd leave this one as-is and then get myself four others to display photos of me with each of the four Mansions I've visited (and probably a fifth for the freshly opened Mystic Manor at Hong Kong should I make it there, and probably a sixth in case Shanghai gets a Mansion/variation). This frame is more plentiful, even showing up at World of Disney in Florida's Downtown Disney, which makes sense because if you get just one Mansion collectible it's going to be this. Hopefully it will become a perennial and do well enough they'll finally make a license plate frame in the same style! This is a pretty rockin' set! Tony is as "signature" as you can get for him in this movie and he comes with alternate normal and Mark VLII arms and hands. The Heartbreaker is my favorite armor from the film (despite it being more visible/identifiable in the marketing that the film) so I am pretty ecstatic to get here. I'm famously anti-detailed sculpts on Minimates but this one turned out pretty darn cool. 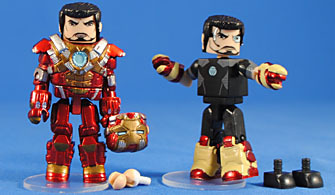 He even get's a slightly different Tony-face, and there is a stand for both figures. 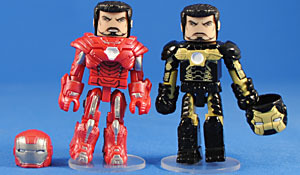 This is actually my favorite of all six Iron Man 3 two-packs and highly recommend it! I like that DST decided to give us some of the cool armors from the film (unlike Hasbro) but I must confess these are two of the least interesting to me. I've never been a big fan of Silver Centurion as the silver-and-red doesn't work for me that well, but the armor is well sculpted and painted here. Likewise, the black and gold (or creamy yellow, here) look of the Skeleton Armor is just kind of garish but I understand why they chose it (it's just a repaint of the Mark V/Suitcase armor). Both figures have removable helmets, slightly different facial expressions, plus duplicate hair pieces and stands. It's a neat set but I can't help but wish they'd pick some of the more interesting looking armors like "Igor," "Red Snapper" or "Deep Space." I had no idea this figure existed until I walked into Walmart this weekend and saw him sitting there! This is a neat figure, mainly because of his accessories. 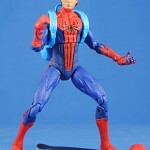 Much like the Marvel Select version I got his guy comes with interchangeable masked and Peter Parker heads. The Parker is fully painted and is actually a pretty good likeness (I wish Hasbro had a civilian figure out there we could put this head on to have a proper Peter figure). He also gets a pretty decent backpack and a skateboard. 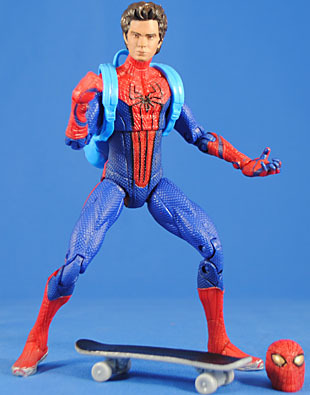 There is a "regular" Spider-Man figure in the line, which is the same as this but minus the Parker head, backpack and skateboard but plus a web doodle. Clearly this version is the winner. The red plastic also has that "cheap" sort of look to it. All in all, I'm pleased to add him to my 6" movie collection, particularly because this is a cool costume (and I'm mighty saddened they going back to the boring "classic" look for the second movie). Oh jeebus. You ever buy something knowing it'd going to be bad but feeling you need it for the collection, then each step along the way you realize more and more that you've made a $17 + tax mistake? Well you're looking at one. I really appreciate what they tried to do here, and in all reality it is mighty commendable. 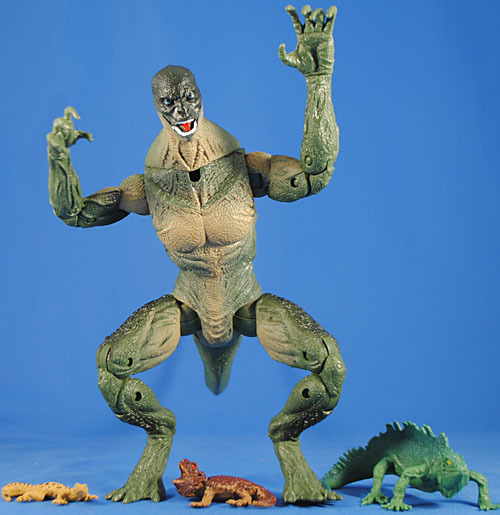 If you're shopping for plastic volume and articulation you can't do much better than this figure. Otherwise... just get the Marvel Select one from DST. Tons of articulation and most of it quite good, but the head is basically a swivel joint and both wrists are definitely swivels, plus there's nothing on the tail south of where it connects to the body. Frankly the best thing about this are the three pack-in lizards - an iguana, "horny toad," and gecko. I'd been putting this figure off for quite awhile because it, frankly, turned out fairly boring. I needed the dollar-amount boost for a recent TRU promotion so I finally bought in. She's good enough for what you've come to expect from Marvel Universe. While it's pretty accurate I do think I'd have preferred her "clothes" to be slightly more blue. I was surprised by how well the psi-energy accessory clips snugly on to her arm but it would have been far preferable to get a new sculpt with his signature psi-blade. Boring though she may be she does help get us one step closer to a complete Jim Lee team, which is really the only thing I care about when it comes to X-Men. Toy of the Year. That's it - we're done. I really did think the buzz was a combination of hype and "we finally got a Dutch figure" but I was wrong - this figure has it all! The sculpt is utterly fantastic and one cannot talk about this figure without mentioning the immaculate, Hot Toys quality Schwarzenegger likeness. The paint is likewise quite good and I'm fairly surprised at how well the unpainted, dyed-plastic of the skin looks against the painted hair, clothes and accessories. The big surprise was the articulation, which is hidden well but all with a remarkably good range of motion. 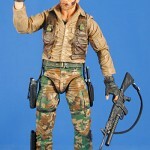 The left hand is sculpted just wide enough to both comfortably hold the grenade launcher on the machine gun as well as cup the right hand from below, over the fingers, etc. It may seem a small, pointless detail but in terms of posing it makes ALL the difference in the world. 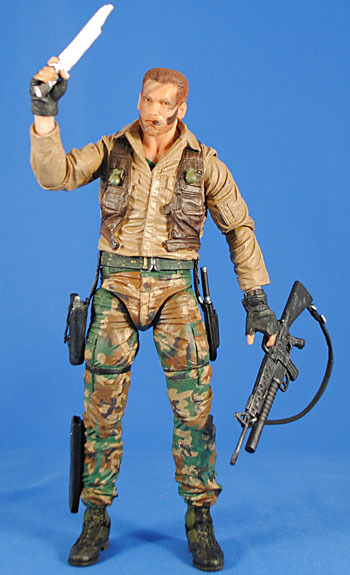 I applaud the whole team at NECA loudly for this figure. They've set the bar even higher than before. This is another great figure from NECA and is actually my favorite of the two in this series (while the other is 'the best'). 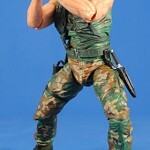 The jacket looks great and is well sculpted and painted. I also adore the cigar-chomping head, but that is one thing that holds it back from the perfection of "Patrol Dutch" as it, and especially the sideways-looking eyes, limit the posing options by making it more specific of a figure. Similarly the gloved left hand is just a bit narrower than the other figure's meaning he can't do the right-hand-grips the other can. But all of this just means that while "Patrol Dutch" is an 11, "Extraction Dutch" is just a lowly 10 out of 10. 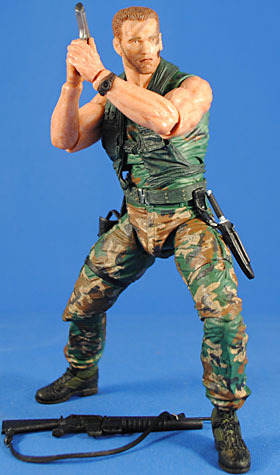 2013 is undoubtedly the year of NECA. My local Toys R Us finally got in the final set from the amazing Western theme that I needed (except for the $150 Fort...) and for better or worse I find it the least compelling in the series. 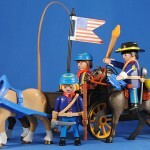 I quite like the quality here but I've never been a fan of Playmobil's horse-drawn cannon sets. Plus, these new Yankee soldiers oddly have shirts that are a darker blue than their hats and pants creating an odd look. The captain's hat is pretty cool though, using that neat two-tone molding process as some of the new Pirate hair, and the cannon is a very cool new sculpt with an American eagle sculpted on it. You certainly do get a ton of stuff here do volume-wise making it worth the $30, but unfortunately this set really just doesn't "tell a story" unlike the other sets nor does it have much appeal as a repeat purchase, which any army-builder should be when the big ticket item is their fort. 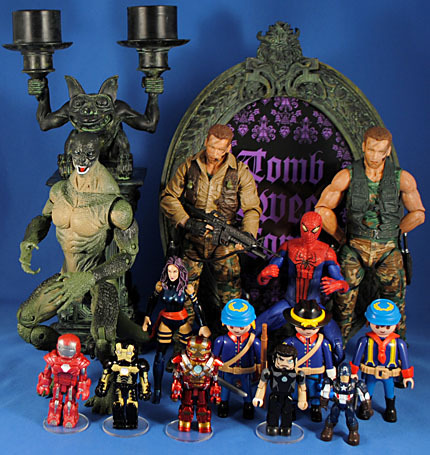 This entry was posted in Art Asylum, NECA, Playmobil, Rustin's Spoils of the Week and tagged Captain America, Iron Man, Marvel Universe, Minimates, Predator, Spider-Man, X-Men. Bookmark the permalink. Meh, I much prefer Spidey's look in the upcoming sequel than the first one. Maybe it's 'cause I'm an old fuddy-duddy, but the new one is so much closer to the classic comic design, while the original just seemed to be changed for the sake of change, and that never turns out well. I honestly think the main reason the first movie changed the costume was just to distance itself from Sam Raimi's version. Both of which I'm perfectly happy with. I don't care for any of the Raimi films and find the "classic" Spidey costume boring and dated. You know, I always wonder why such a fuss is made over costume choices in movies, it's like fanboys expect actors to just cosplay the characters , which would probably result in them looking like they were running about in cheap halloween costumes, instead of something that actually works in the context of a movie, I really liked how Amazing's costume looked, especially when in motion, but fanboy whining being what it is has ended up with the same old same old, such a shame. Great haul as usual anyway Rustin, those Iron Man 3 minimates don't look as interesting as the Iron Man 2 ones though, shame. Changing a costume is fine, as long as it's a change for the better. Or even a lateral move. For instance, Blade, who never wore tactical gear in the comics until after his movie came out. Or Captain America, who was wearing something that looked like it was made out of military-grade materials, rather than chainmail and pirate boots. I can accept the silly gloves, boots and orange eyes if it means we get the much better, sleeker looking torso pattern and no ridiculous "belt." None of these films seem to care much about internal logic of where the costume comes from, so if it's going to be improbably detailed and well-sewn it might as well be interesting to look at. In reality there are four other sets, which is why I didn't get the two you mentioned from Toys R Us. It'll be much easier to just order a set of the specialty market sets which includes those two. 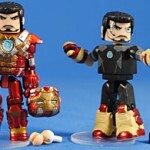 Rustin - you want the extra Marvel Mega Bloks figures? I have almost all of them and don't want them anymore. Possibly... Loki's really the only other one I'm after. I'll get back to you on that. 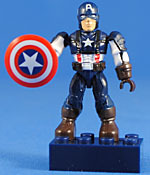 I'm absolutely with you - any Mega Bloks I own, I own simply because 'they exist' rather than they're 'something I like.' 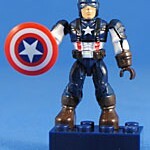 They have their fans, and that's great but Lego is like Minimates - many imitators but no surpassers. And I totally agree about NECA. With ALIENS coming up soon that could give Dutch a real run for his money, and lets not forget the probable glory of their 1/4 scale Batmen! 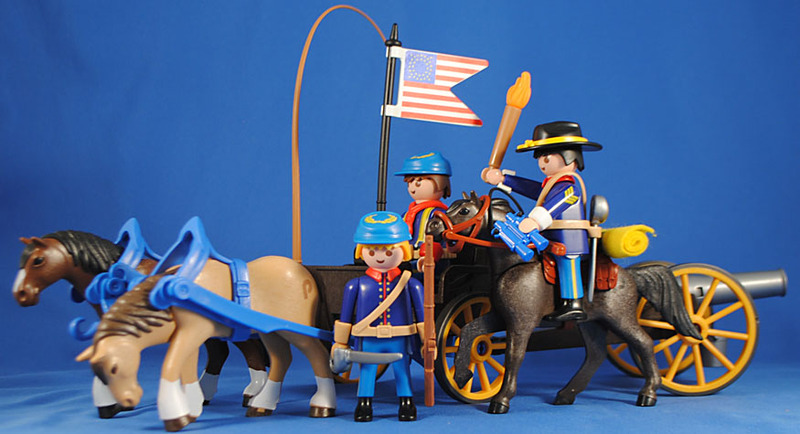 As awesome as Hicks and Hudson look, I just don't think they can compete on icon power like Dutch and it would take a crapload of innovation to make them more fun figures. Not to take away from the Colonial Marines at all, but they really have increased coolness from the group rather than as a solo figure. And now they have! Spoils are great for reminding fans what we didn't have as much as what we did. 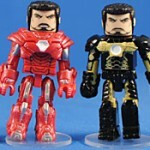 I must have that Heartbreaker Minimate. It was definitely one of my favorites from the movie (I say "one of" because the Mark 42 has really grown on me). i agree with the toy of the year comment about the NECA Dutch. he is simply amazing; hands down.